Below you will see photos of some trees I wove using a pin loom. The original designer of the pin loom tree idea is Cathy Clarke—NOT ME. Cathy is apparently grieved that this blog post has been shared innumerable times on Pinterest without credit being given her for the design. She seems to be under the impression that I have stolen her design and am presenting it as my own (see her comment in the Comments section, below). This is not the case. I have never claimed the design as my own and never meant to represent it as such. So I APOLOGIZE AGAIN for appearing to have done something dishonest. Now we will return to the blog post as it first appeared. During the course of the Weave-Along (WAL) I’ll be exploring some different techniques. One of them is adding beads to your squares. 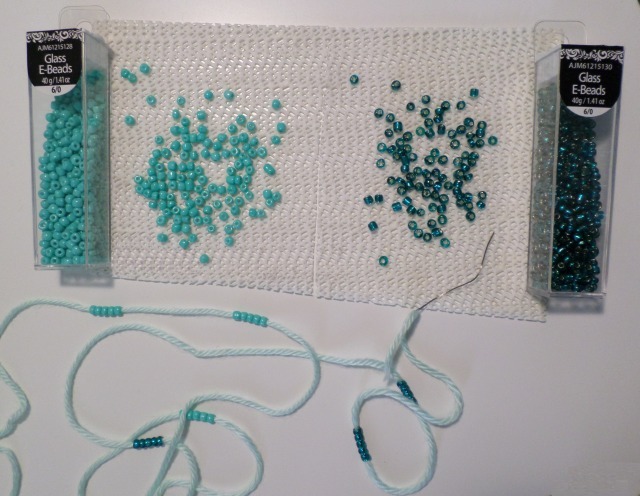 First let’s look at why and when you might want to add beads. Why? Because they’re pretty. Beads can really dress up a piece of weaving. They can also be an accent or trim. And it’s fun to create something different by weaving them in. When? Obviously you can use them whenever you want, but there are some patterned weaves that lend themselves better to beads than others. 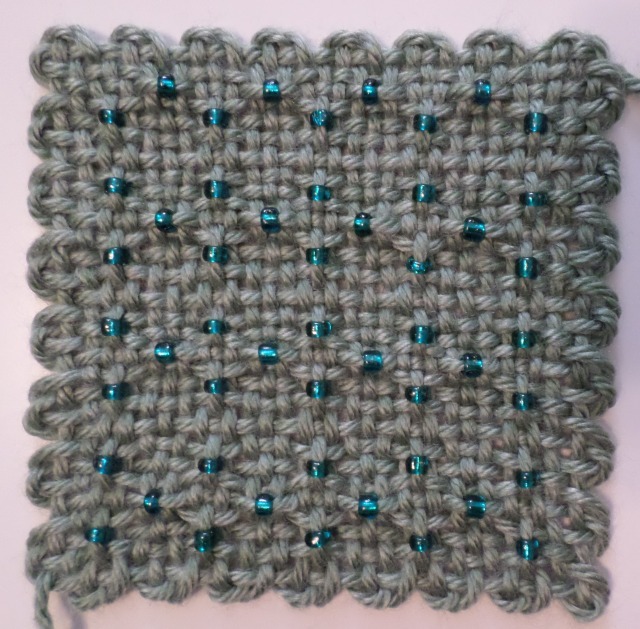 And if you’re planning to use beaded squares in a project, be aware that adding beads increases the weight of the square. How? 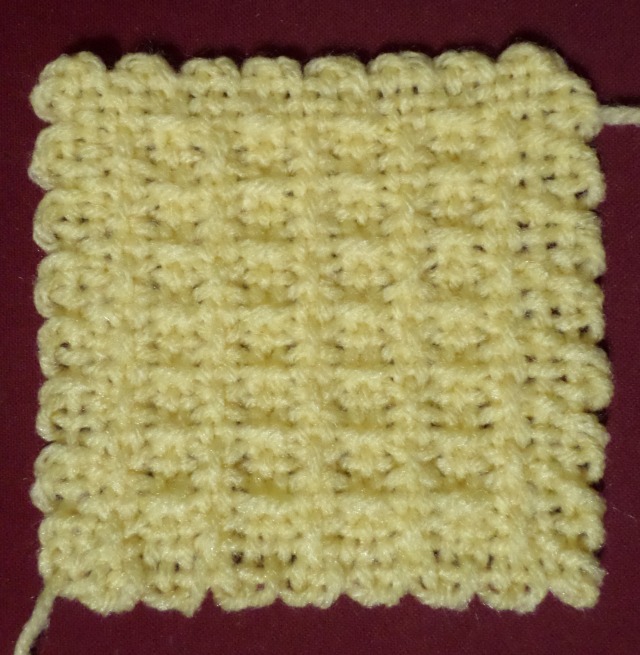 Probably the easiest way is to randomly distribute beads on one or more layers of a plain weave square. 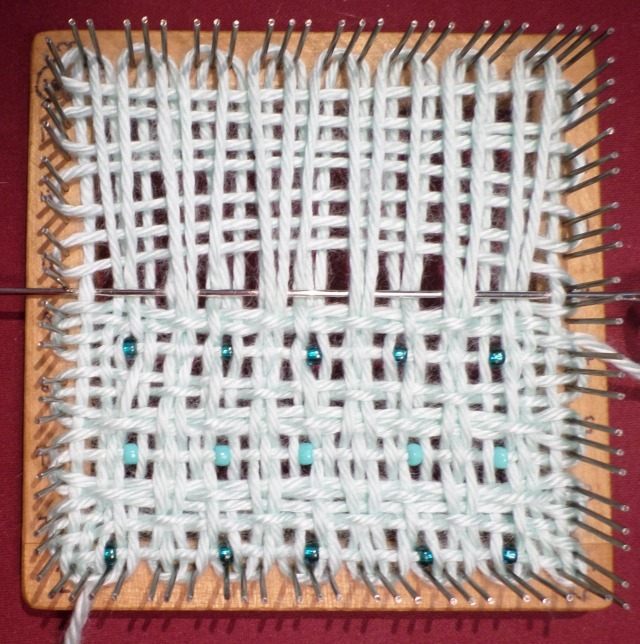 Here, beads are distributed two or three per row in Layer 2 (shown on a 2″ x 2″ loom). Three colors of beads distributed throughout Layers 1-3. Note how beads lie in both vertical and horizontal orientation. I added white beads to the white background for extra sparkle. Choose your yarn color wisely. Make sure the beads don’t get lost in the yarn–unless that’s the look you want. 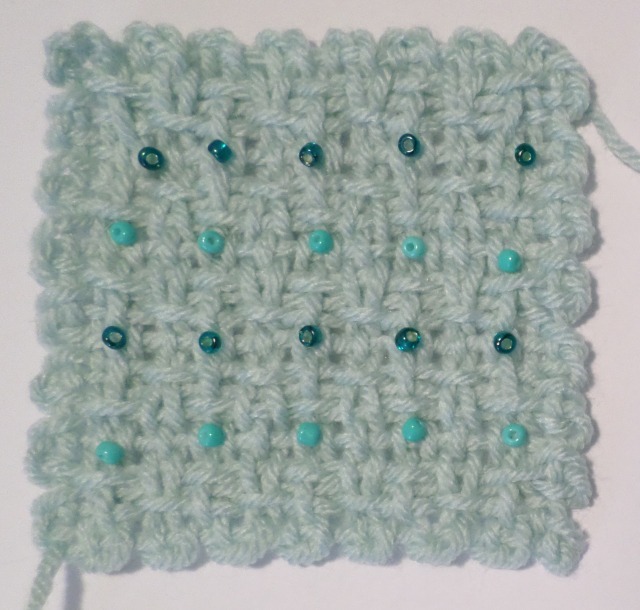 In this square, Layers 1-3 were warped in spring green yarn, white beads are scattered across Layer 2. Layer 4 was woven with variegated yarn. In this square,”Spring” (from the tree series) is suggested by the beads and variegated yarn–clumps of ice-white snow on partially bare branches whereon blossoms are beginning to bloom. 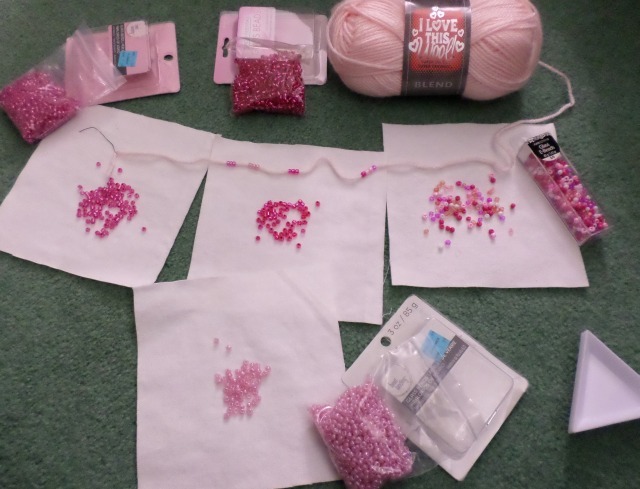 There are other ways to add beads too, such as within a pattern as you’ll see later in this post, but first . . .
What beads should I use? How do I choose the yarn? These are important issues to address early in this discussion. When I first thought about adding beads directly in the weaving I sorted through my modest collection of beads and pulled out several strands and little packages, most of which were unsuitable because beads generally have a tiny hole appropriate for stringing on wire. In order to string beads on yarn you need beads with a hole large enough to accommodate two thicknesses of yarn and a flexible needle (or wire threading device–I use a piece of wire pulled out of the selvage of decorative ribbon). The only beads I know of that have the proper size hole and the proper outer size to fit between strands of yarn, are Rocaille, or “E,” 6/0 mm beads. These beads are easy to find at craft stores, and even WalMart. It seems the cheaper the beads, the more likely you are to get larger holes. 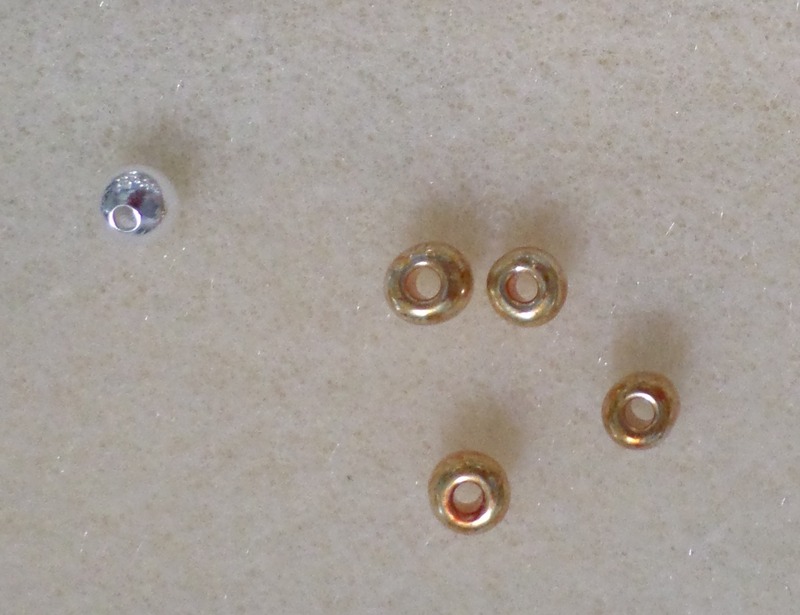 Some Rocaille beads don’t have very large holes, so check the beads before you buy them. 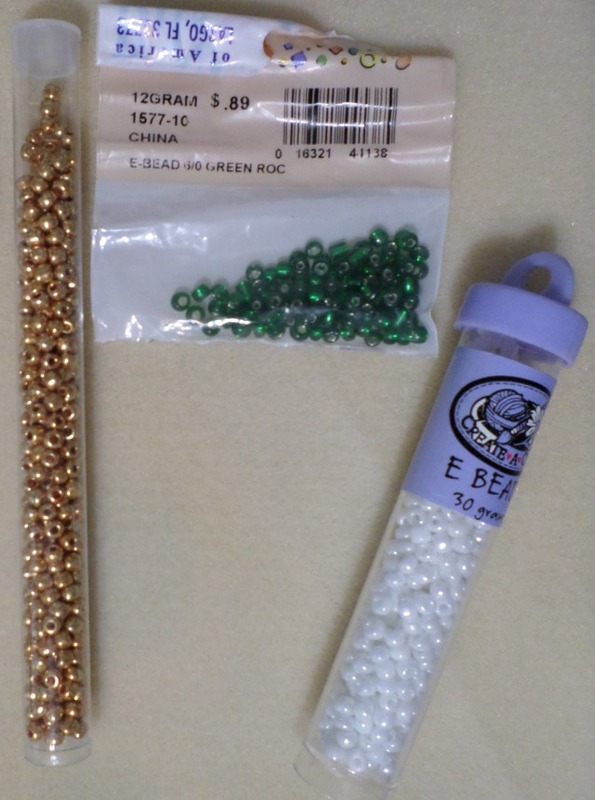 Different packages of Rocaille, or E, beads. You’ll need thin-but-thick yarn. I generally use acrylic yarn and have found that Caron Simply Soft (CSS) handles beads really well. I have also used Lion’s Cotton-Ease and I Love This Wool yarn. I’m sure there are others. Sport weight acrylic yarn readily took the beads, but wasn’t quite thick enough to form a substantial weave in the tree series. 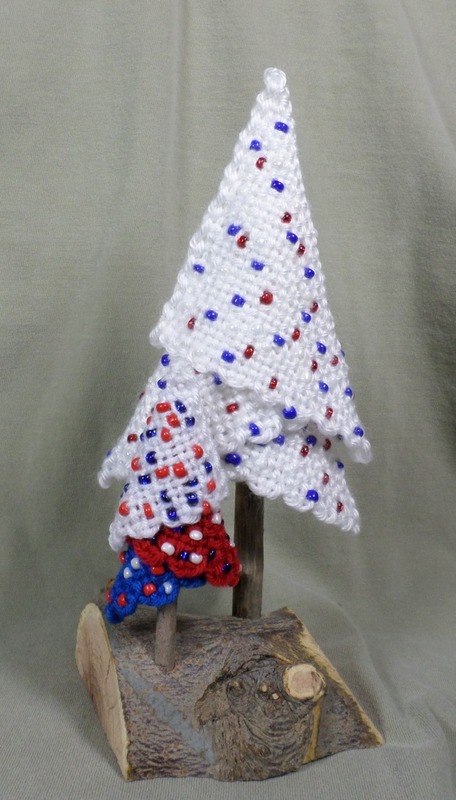 The larger tree (“Fourth of July” from the tree series) was woven using CSS. 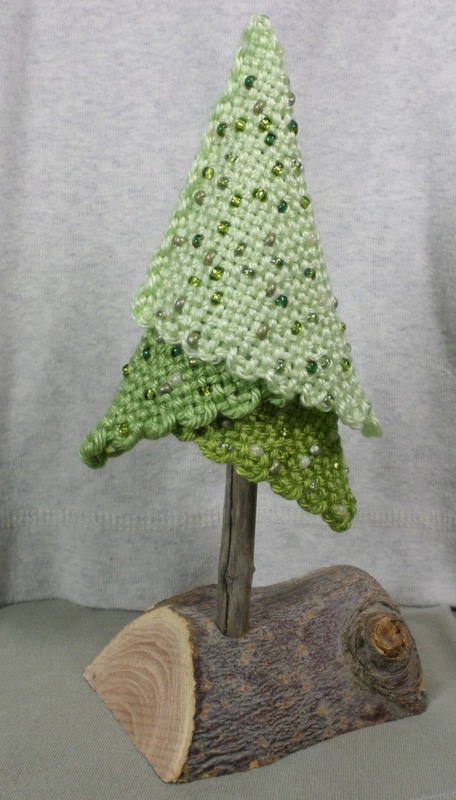 The smaller tree was woven with sport weight yarns which are not substantial enough to form a tight weave–particularly apparent in the white tier of the little tree. 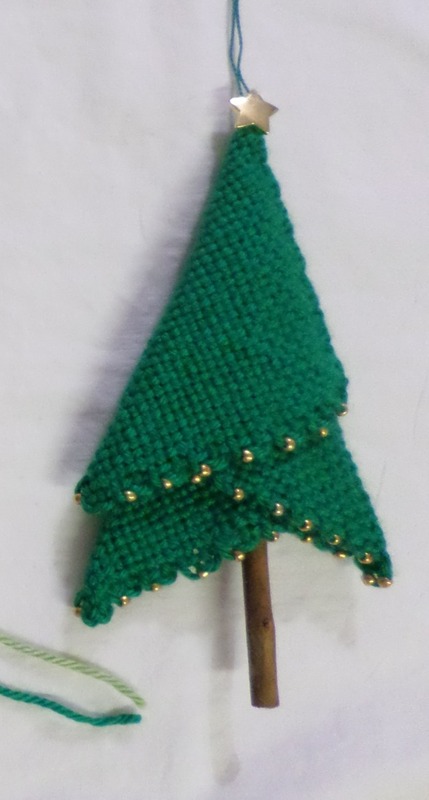 Also, the smaller tree was woven with the same colors but different beads. Those beads are larger than the all-white tree beads; I think I used too many and the little tree doesn’t look as good. Try the beads out to test yarn, bead, and color compatibility. Obviously there are times you don’t want beads in your work, so we’re talking about: When you do want to use beads, why might it be a bad idea? 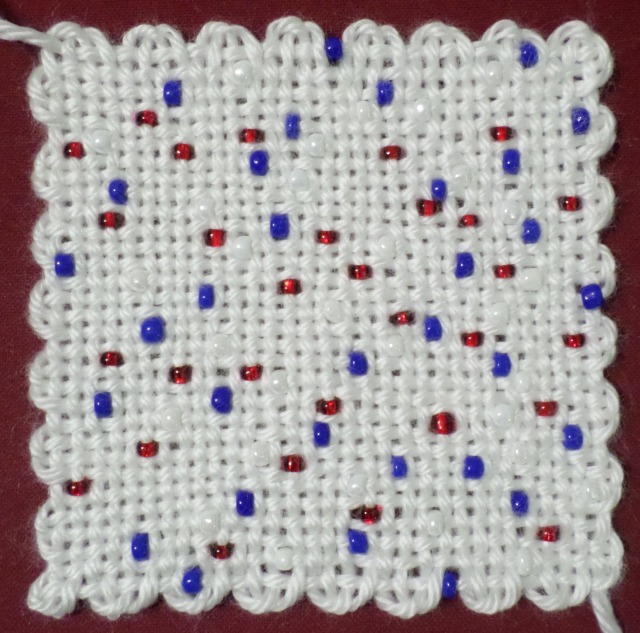 I chose to add beads to a square made with the “Horizontal Xs” pattern. I could readily see where I wanted to add beads: basically every time I went U-3 or O-3. I counted the number of U-3 beads needed for each Layer-3 warp thread, threaded them onto the yarn, and distributed them as I warped the third layer. Then I threaded all the beads needed for Layer-4 onto the yarn and began weaving. 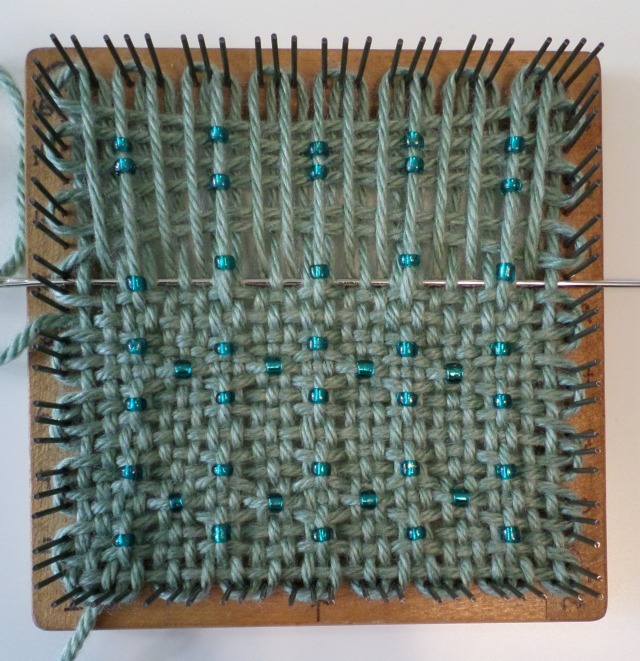 I quickly discovered that the entire group of beads would not slide through the warp threads, so I took them off and wove till I was ready for the beads. It turned out that in order to get a bead in place, I had to weave up to where I wanted it, unthread the long needle, thread one bead onto the yarn, rethread the long needle, weave in the one bead, and weave the next 3 beadless stitches. Then I had to re-do the whole unthread, thread, rethread (UTR) process every time I wanted one bead in that fourth layer. Time to modify the pattern! Instead of adding beads on every odd-numbered row, I plain wove every other odd numbered row. Beads were added to Rows 3, 7, 11, and 15. Rows 5, 9, and 13 were plain weave. I think the square turned out prettier with fewer beads after all, but I don’t like the UTR procedure–four times in every row is more an endurance test than a pleasure. You’d think I’d have learned my lesson, but I didn’t. I wanted to try adding beads to the first WAL pattern, so I planned out where I thought the beads would look nice. 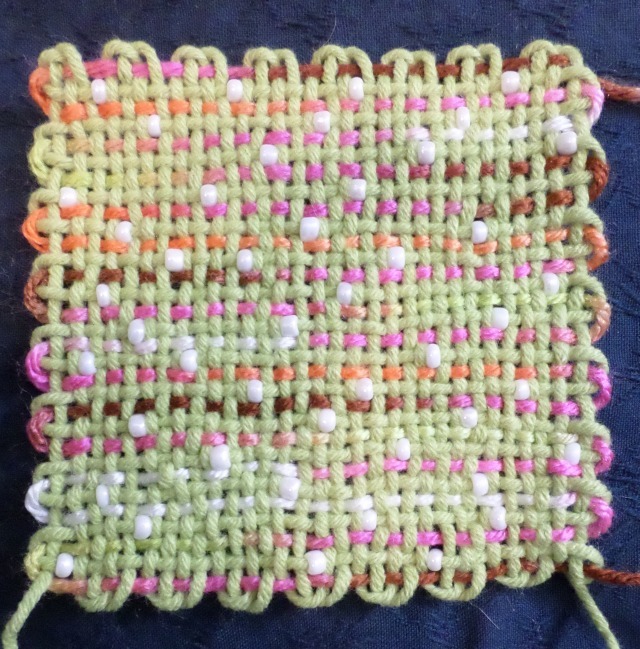 I thought beads would look pretty in the plain weave rows. I’m not sure when it dawned on me that I’d have to weave them in one at a time again. I picked out beads that fit onto the yarn, then took them off the yarn and started weaving. I chose all my beads ahead of time to make sure I’d have enough that fit readily on the yarn. Again, not sure what I was thinking . . . or why I wasn’t because, like some kind of a kook, I added an extra row of beads in the first and last plain weave rows. I think I forgot what a pain it was to UTR the needle. This is as far as I’ve gotten with the WAL-and-beads project piece. Usually I’m pretty good about sticking something out, even when it’s unpleasant. It’s just a 4-inch square, the UTR process won’t take forever. But it became clear to me that the beads aren’t going to look good in this piece. They’re not anchored between two threads, rather three, so there’s no center point for the bead to sit. 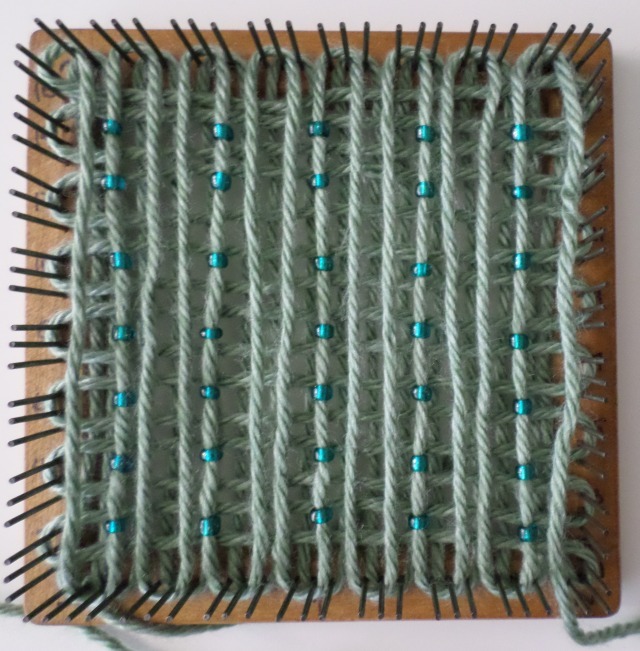 I thought, “Ah ha, they need to be on the warp threads!” But in that case, the bead would be sitting on a weft thread and still wouldn’t stay in place (i.e., a weft thread would be running directly under a round bead, which bead would roll either up or down around the yarn). 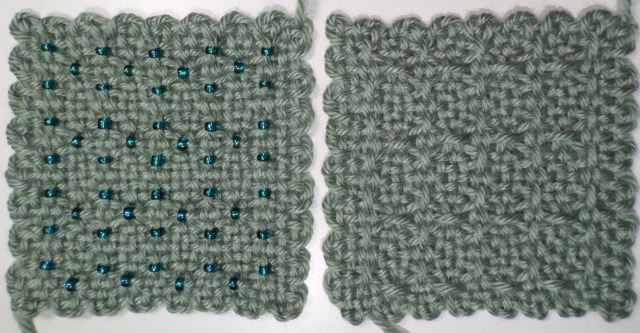 I finally concluded that because the beads are spaced so far apart–side to side and row to row–and changing them to the pattern stitch rows wouldn’t fix the spacing problem and would still require beading on the fourth layer, THIS PATTERN is unsuitable for including beads. No doubt someone will turn right around and prove me wrong, but I’m speaking in general here. Adding beads seems to detract from the effect the “Open Weave” is trying to achieve–its light, lacy-ness. Any horizontal Over stitches will appear in Layer 4 and will require UTR. A bead placed on a vertical (warp) thread will show whenever the needle goes Under it, e.g. a bead placed on the middle strand of a U-3 stitch will be centered and not subject to UTR. There are probably more “rules” to come, but this is where I am in my beading experience so far. 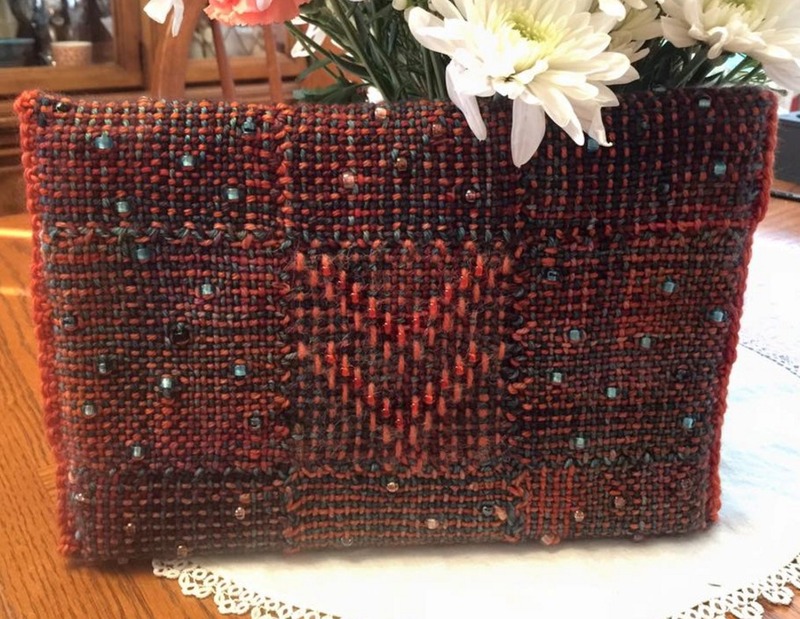 I have Laura Sapko’s permission to share these photos of a beaded purse she made with pin loom squares. Her work is exquisite–tasteful, precise, and stunning. 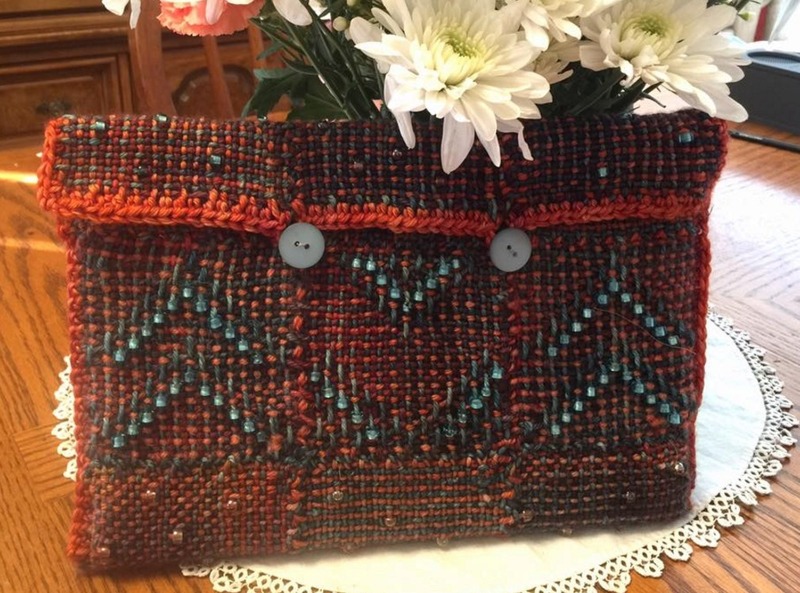 I’m so impressed with the colors and artistry of this purse! 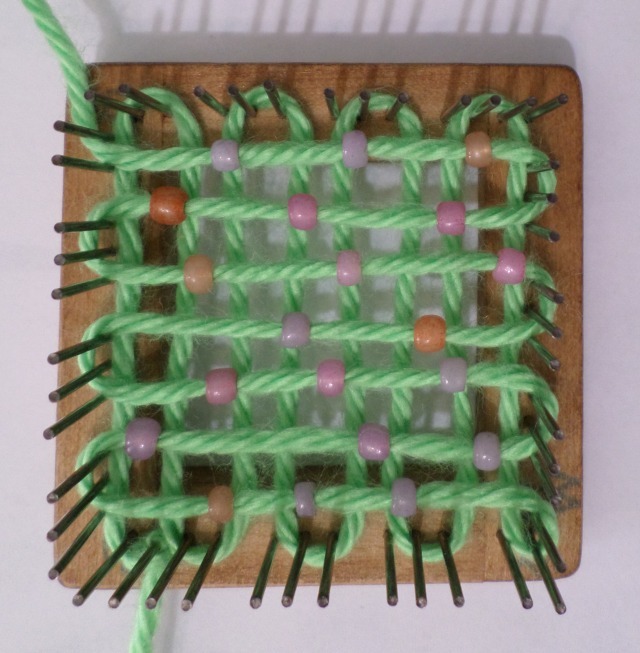 Awesome tutorial on using the beads with weaving! Nice work with that Horizontal X pattern! Thanks, Laura! And thank you again for letting me show your work. It will inspire anyone who sees it. It would be nice if you publically acknowledged me as the creator of this original idea. I’ve asked you to do that before and now I find it’s been shared on Pinterest 1.7k times, under your name. Theft of creative ideas is pretty low. I’ve tried numerous times to contact you Cathy. The email address you’ve left on your user registration apparently doesn’t receive incoming messages. I apologize once again for mistakenly not giving you credit for the original tree design. When you contacted me last November I immediately added credit to two of my blog posts that discussed how I made the trees. I will now search through my blog and find every post that has a tree in it and either make the post private, delete the photos, or add your name as designer of the original tree pattern. I have never, ever, ever, ever, ever, ever claimed to be the originator of this idea. Your insinuation that I am a thief is most painful to me. I don’t have a Pinterest account and I don’t know how Pinterest works. Please tell me what I can do to remove this 1.7k-times-shared information.